I like this pot roast for several reasons. It takes about 3 1/2 hours, but that is oven time not hands on time. The prep is fifteen minutes and then it goes in the oven and you go about your day. 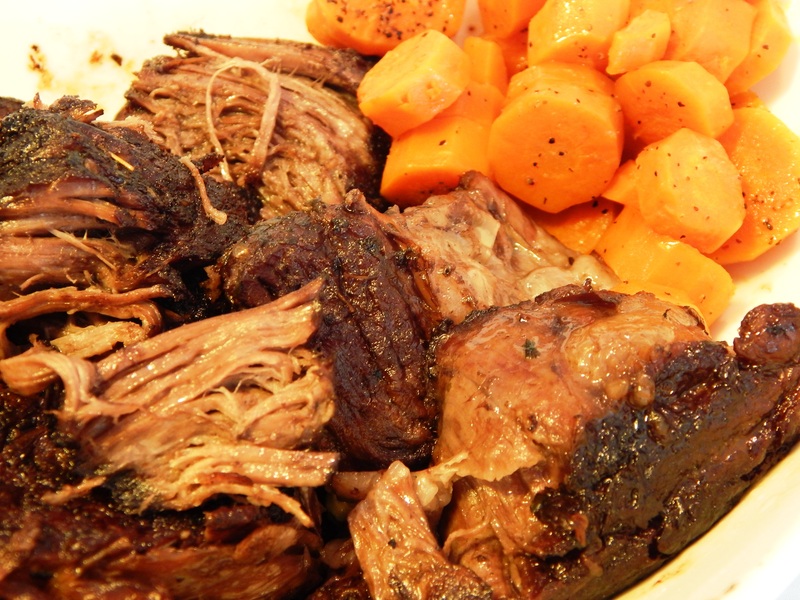 It is moist every time…..no dried out hard to chew pot roast here. I make it often, because it is a winner! There is a lot of flavor, and you can change up the sides depending on what is in season and the time of year. People will ask you for this recipe. So let’s get to it! Season your Beef with Salt and Pepper generously. Using a Dutch oven or other heavy oven proof pot with a lid, heat 2 tablespoons of Garlic Infused Olive Oil over medium high heat. Add your seasoned roast (make sure oil is hot enough to sizzle when beef is added). Brown five minutes without touching the meat, then flip it and brown five minutes on the other side. Take the gorgeously browned roast out of the pan and set it on a plate. Add a Cup of Dry Red Wine to the pan and release all the brown bits, bring to a boil for a minute, then add the broth and seasonings. Add the roast back to the pot with the burner still on and bring it all just to a boil, then place the lid on your pot and place in the 350 degree oven. Roast for three hours, flipping after an hour and a half. After three hours remove the roast from the oven and let it sit with lid on for fifteen minutes. Serve with sides of your choice. Here it is shown with some sauteed carrot coins. I love to hear your thoughts. Eat well, you deserve it! It is that time of year when cold treats taste so good! I adore the flavor of toasted hazelnuts. 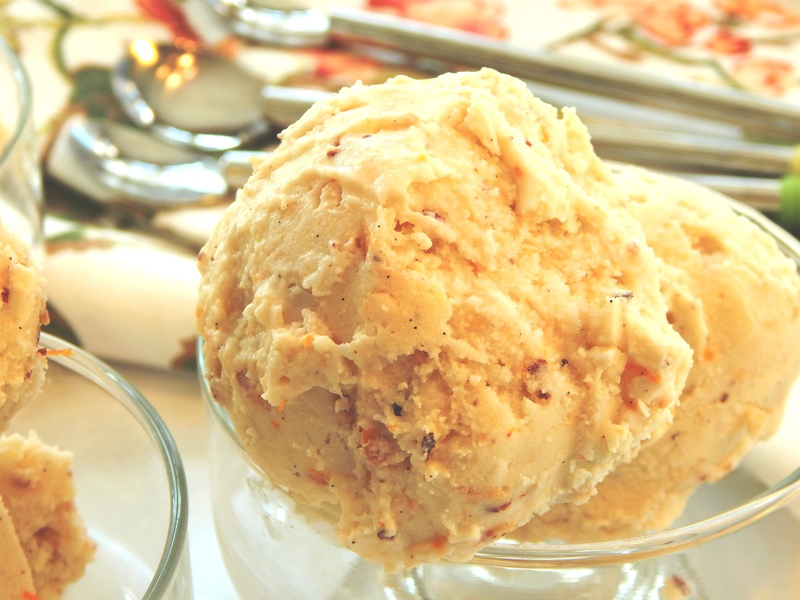 There are flecks of real vanilla beans in this ice cream and a creamy orange flavor which melds beautifully with the toasted hazelnuts. The vanilla, hazelnut and orange go so well together. This ice cream is dairy free and egg free. It is gorgeous and gourmet! Wow people with this easy and amazing ice cream! Preheat oven 350 degrees. Place whole hazelnuts on a cookie sheet and toast for ten to fifteen minutes until the hazelnuts skins start blistering and the nuts start to brown. Remove from oven and place in a lint free clean dish towel and wrap and let sit for one minute to steam. This helps release the skins. Now roll the towl around with the hazelnuts inside to remove most of the skins. Cool and then finely chop the hazelnuts. I like my mini Ninja for this or you can do it by hand. Heat the coconut milk on the stove top until it comes to a simmer. Split your vanilla bean length-wise and scrape out the seeds with a spoon. Add the seeds and pod to the heated coconut milk and turn off the burner and steep for ten minutes. Remove the vanilla bean pod and discard then whisk in the remaining ingredients except the hazelnuts. Chill completely at least 6 hours. You can do this step a day ahead of freezing the ice cream too. 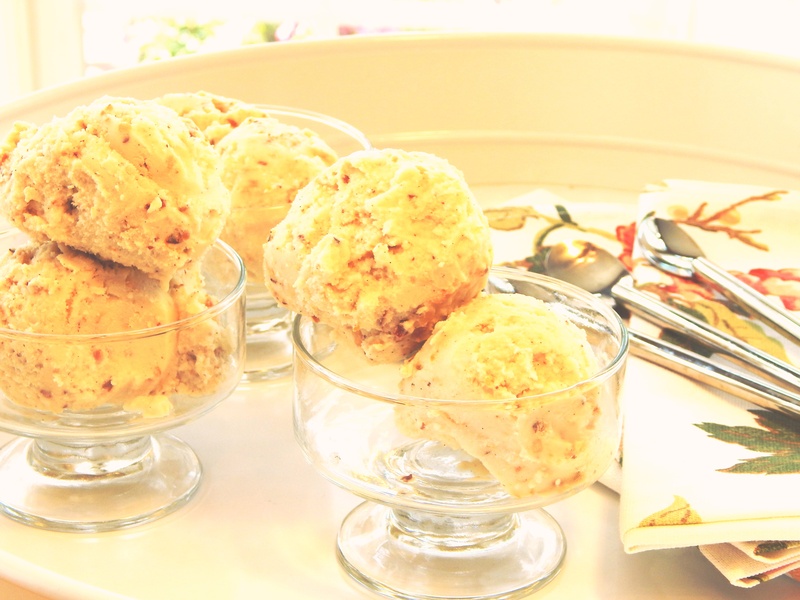 Put the ice cream in your ice cream maker and add the hazelnuts and freeze the ice cream. Serve! Yum! This ice cream is spectacular with my Summer Strawberry Pie. (recipe coming soon!) The flavors complement each other in a delicious way! Ming is a great listener! She also understands a lot of what is being said. You can tell her “Skyli will be home soon!” and she runs for the door, or “Lucy is coming over” and she runs to the window looking for her. Lucy is a Black Lab and a member of the extended family. Ming, Ming loves chicken, and when you say “chicken”, her eyes get really, really wide. She also watches t.v., especially if there are dogs in the show. But what I love most about how Ming listens is when she just sits and listens while I am in the kitchen. She sits near my feet and is content to stay there as long as I am there listening to me talk to her as I work. She tilts her head side to side and looks straight at me. I could learn a lesson or two from her complete attention. She makes me remember to try and listen as well as she does. 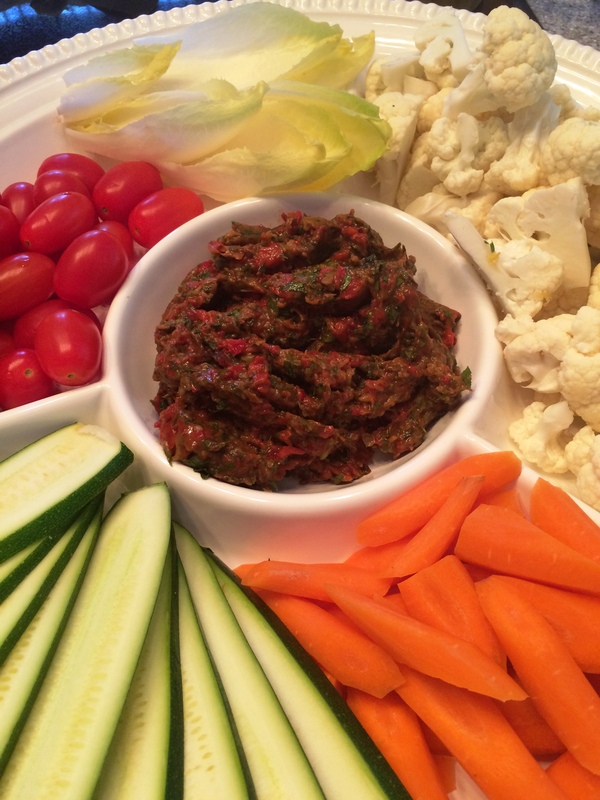 Don’t you love dips and spreads? I do, and it is so nice to know you can make them yourself with great ingredients that feed your body and not only taste awesome, but have nothing but good ingredients. I am also looking for easy and fast! 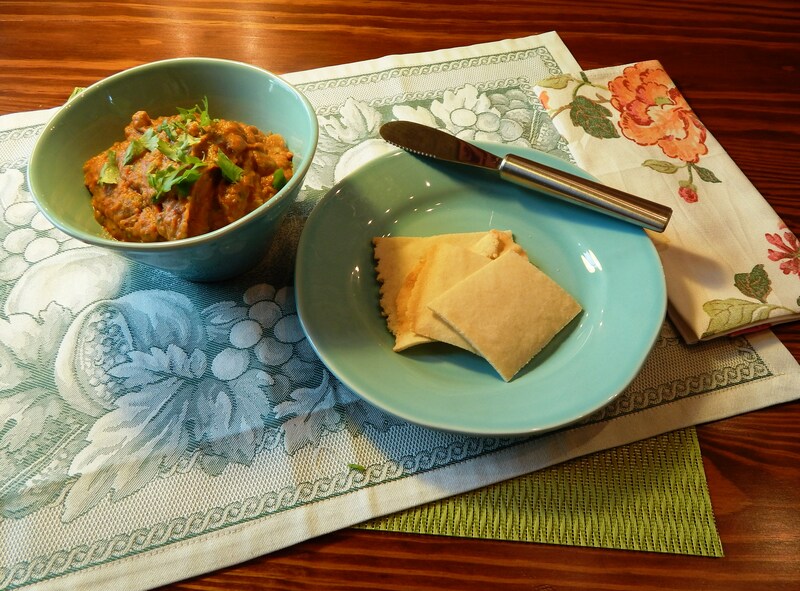 I served this tapenade recently with almond flour crackers. It is good with vegees also, like cucumber rounds, or on top of a salad. The eggplant is peeled before roasting, which makes it easy to digest and pretty when pureed. Preheat Oven 400 degrees. Placed cubed eggplant and peppers on a parchment lined baking sheet and drizzle the olive oil over them and add salt and pepper, then toss until coated. Place them in them in the oven and roast for 40 to 45 minutes tossing a few times during cooking until they are starting to brown and very soft. 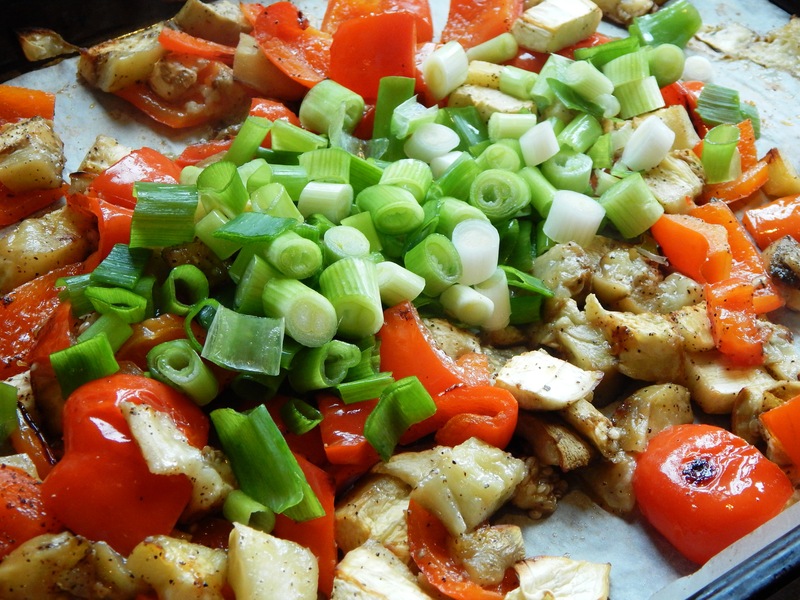 The last 20 minutes of the cooking time, add the chopped green scallions, toss and continue roasting. Remove from the oven. Cool for five minutes. Then, place the roasted vegetables in a food processor with a steel blade and pulse a few times. Add the balsamic, parsley and basil and continue pulsing until blended to your liking. I like just a few bits of vegetables showing and not completely blended. Add additional salt and pepper to taste if needed. Serve! This keeps in the refrigerator about a week and can be re-warmed or served cold. 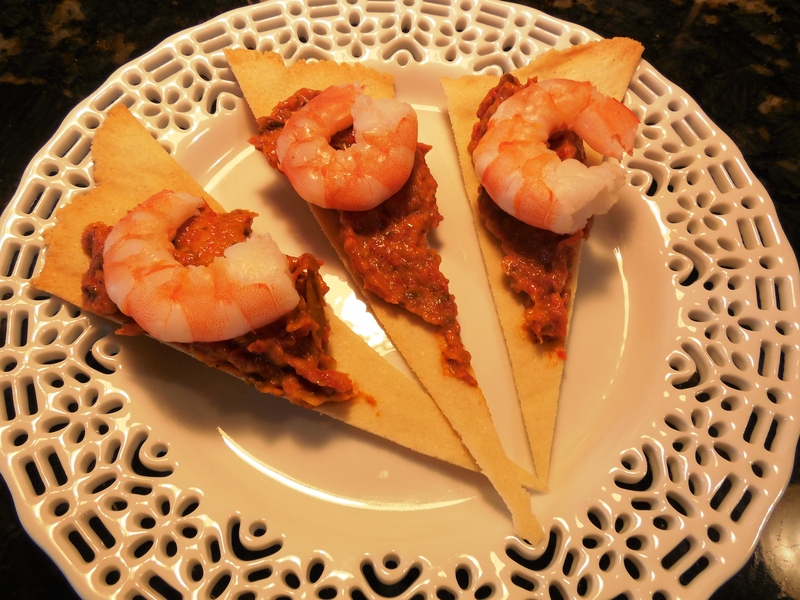 Here is the tapenade served as a shrimp canape. …..and served with crudites! There are so many options for this! Memorial Day weekend is almost here! I always get excited when Summer is just around the corner. I start thinking about fun summery food. 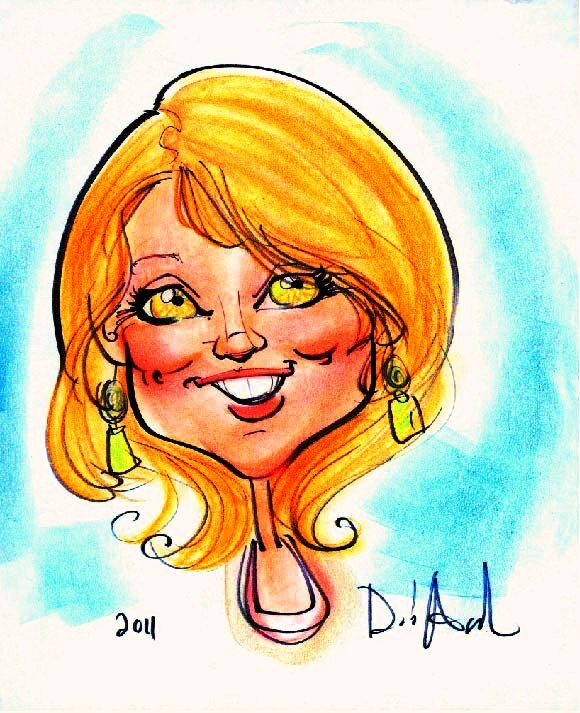 I love the 4th of July, hanging out with family and friends, picnics, the kids twirling around with sparklers waiting for the fireworks to start, parades, barbecues, happy laughter, and lots of outdoor time. 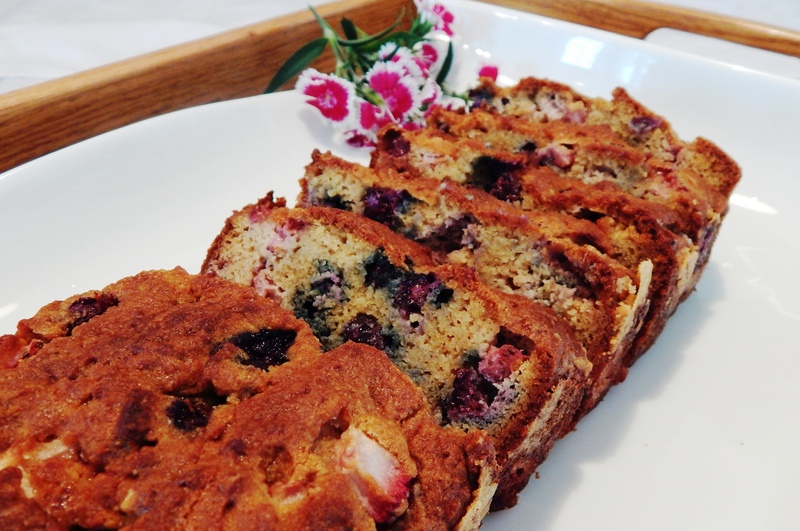 This bread is not only yummy, it is fun and just right for a picnic in the Summer. I am serving this at a cookout over Memorial Day. It keeps well in the refrigerator, so it can be made in advance leaving you more time to play outside! It would also be very delicious and pretty topped with some fresh berries and coconut milk whipped cream if you want to dress it up more. But it is pretty just by itself, and it is soft and yummy. Preheat Oven 350 degrees. Lightly grease a medium loaf pan, then line it with parchment paper. Mix together Almond Flour, Coconut Flour, Baking Soda and Salt and a pinch of nutmeg and the cinnamon. In a separate bowl whisk eggs, then add the clear honey, melted palm shortening and the rest of ingredients up to the fresh berries. Add the wet ingredients to your dry ingredients and mix until just blended. 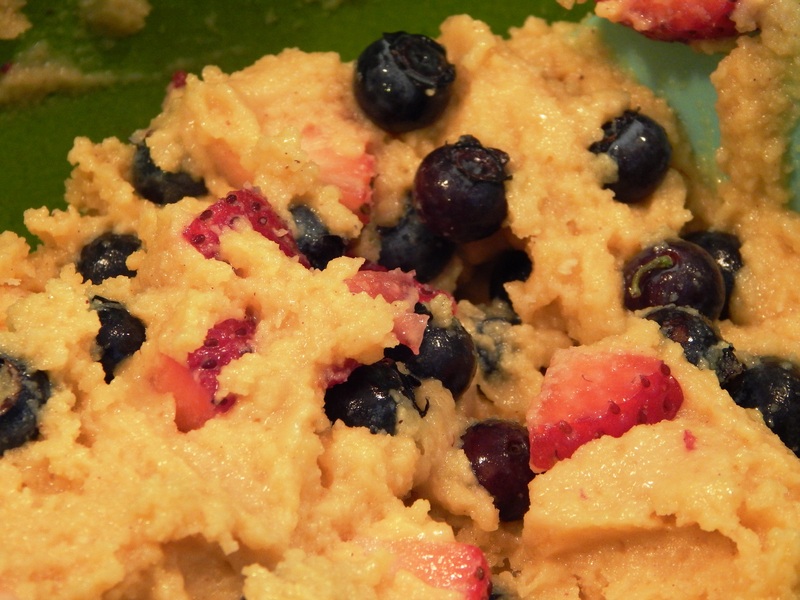 Gently fold in the berries so you don’t start getting swirls of the berry in your batter (Red, White and Blue). Pour batter into the loaf pan, smooth the top, and bake for approximately 50 to 60 minutes until a toothpick inserted in the center comes out clean. Cool on a wire rack for ten minutes, then remove loaf from the pan and cool completely. Serve warm or wrap tightly and refrigerate. It is good warm from the oven, (but give it an hour to cool before cutting) and also cold from the fridge is delightful on a warm day. Store in the refrigerator. You can eat this bread anytime of day. My daughters love it for breakfast! We love to vacation in Northern Michigan by the Great Lakes. That is where I was raised, and I never truly appreciated the fact that I grew up in a year-round vacation destination until I moved away. We have been taking our children back every summer their entire lives. It is a dog friendly state, and we have been able to find a few beaches that allow dogs, so we can take them to swim. Yes, pugs swim! I am a bit surprised, but they have webbed toes. 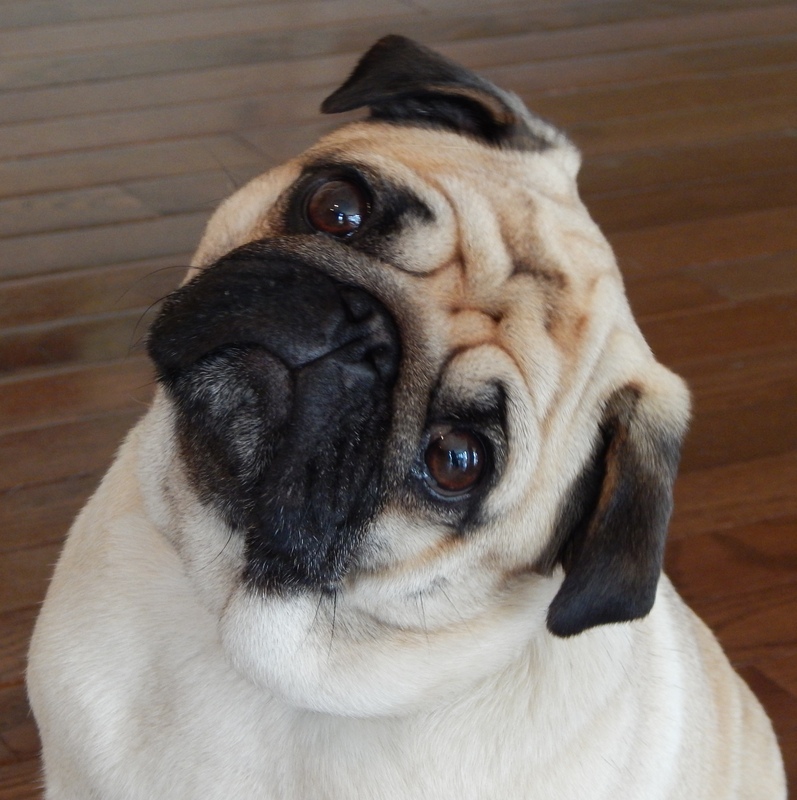 We saw a pug last summer swimming and fetching a ball for it’s owner, and it was just like a fish! Ming likes the water too, but not to that degree. She likes to wade, smell things, put her puggy face in the sand, and run! 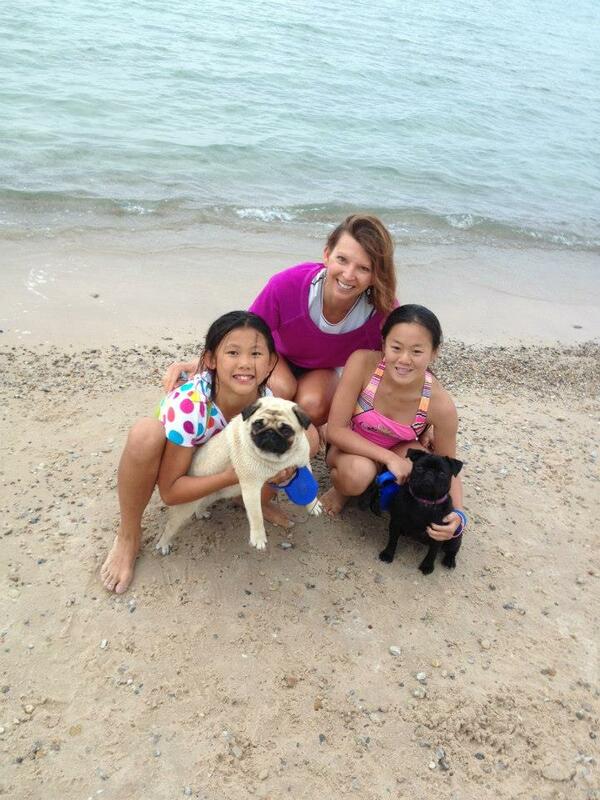 Here she is with my daughters and I, and also her little black pug sister, Lily. This was last summer on Lake Michigan. I wonder what she will do this year now that she is two? Maybe she will be braver and leap into the waves! 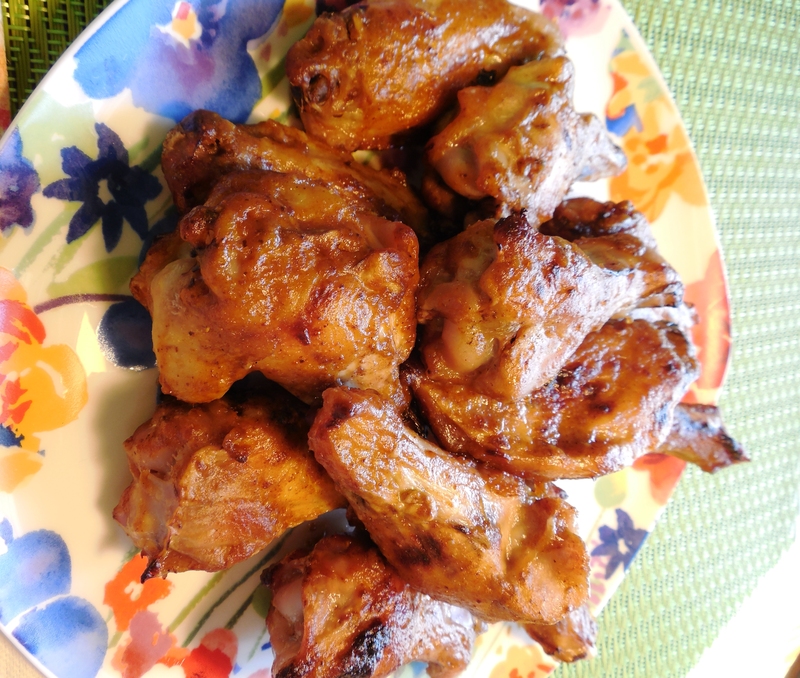 If you are craving some tangy, succulent wings that are easy and everyone will love, this recipe is a great choice! The sauce is quick to mix together. They smelled so good when they were baking in the oven, I could hardly wait to dig into them! They would be great the next day in a lunchbox, but we didn’t have any left, so next time, I will need a double batch. They are baked and then finished off under the broiler to get them nice and crispy. Preheat oven 375 degrees. Lay wings on a parchment lined rimmed baking sheet, sprinkle with a little extra Himalayan Pink Salt and Black Pepper (pre-season your meat to build flavor) and bake ten minutes. Meanwhile whisk up the rest of the ingredients for the sauce. After ten minutes of baking, remove wings and brush with some of the sauce…coat them well. Bake another ten minutes, remove from the oven and turn the wings over and brush again and return to the oven ten more minutes. Repeat once more for ten minutes. Keep an eye on your wings. (Depending on the size of them the time will vary. My wings were medium sized and took 40 minutes.) 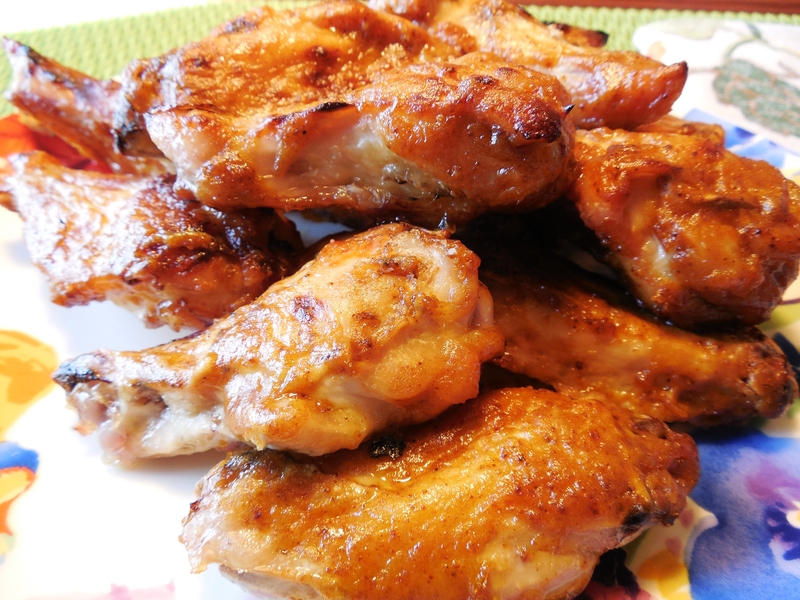 Turn on broiler and broil the wings until they are at your desired crispiness, coating again and turning once. This will only take a minute or two. Serve!